Yours Truly on Giant Bike. Here I am on a giant bicycle. If I didn’t ask Pete from Playa Bike Repair to take the shot, I might not’ve believed I climbed that bike. Nor remembered how gargantuan it was, how slippery and treacherous. 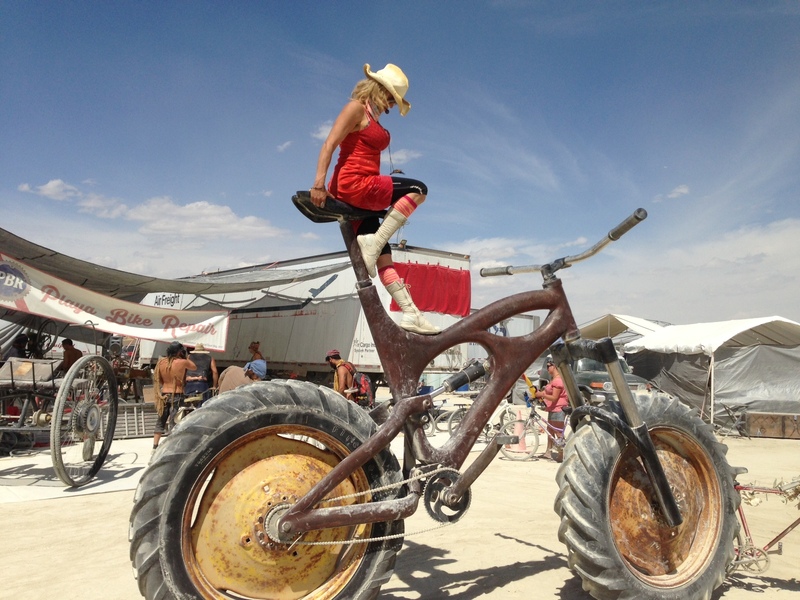 Nor how elated I felt once I was up there, perched over the Playa, on my Mad Max wheeled machine. To me, the moment is about risk, about challenge — and about completion. It is also about physical joy, and play — things I sometimes forget to take care of when I’m going full out in my business. 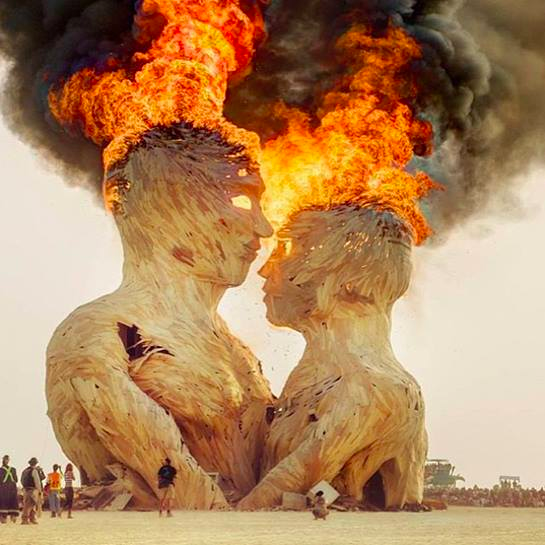 At Burning Man, the ethos is this: embrace each moment. Wrap your arms around its fullness. Feel its beat. The picture tells one thing. I get to fill it out with words so it breathes in three dimensions. So it reveals more. Let me give you some other examples. Ann + Tim on the Playa. This pic is a tribute to Tim + Ann from Toronto. It is also a visual postcard to love in action. When I anchor these pics in captions, it is similar to the way I write moments in words and anchor them in message in a business context. Does this make sense? Another example. Because who knows which image, which words, will reach you. Marcus + Nuria at Sk8camp. I snapped a pic of these two. 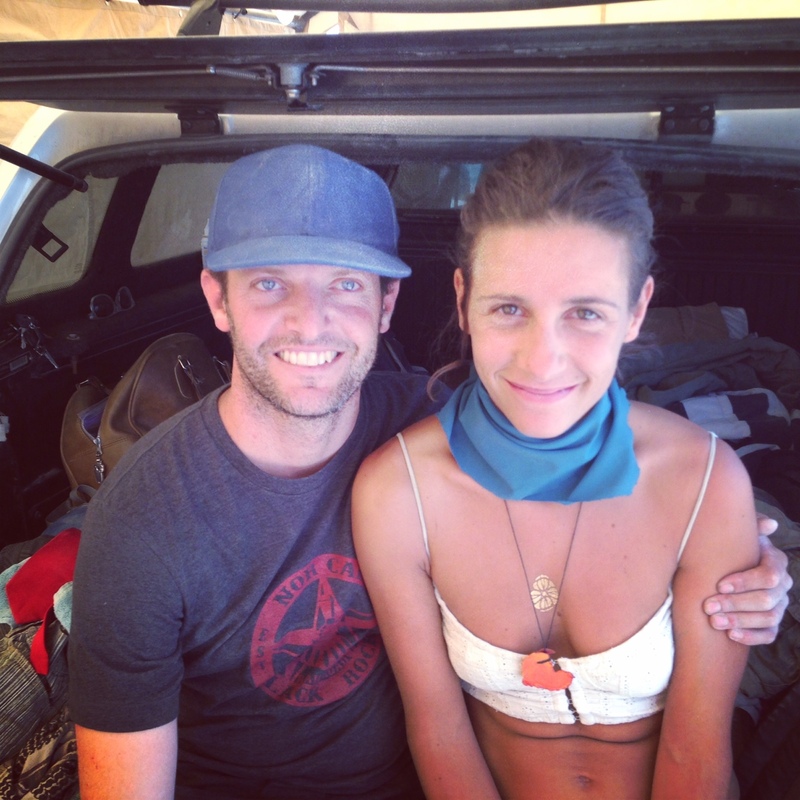 Captured a moment of them together on the Playa. They each told me about the night they met. The boy told me about the moment he saw her. The girl told me what she didn’t tell the boy. So the photo captures one thing. The stories tell another. The imagination washes in. The heart pulses. How fragile and powerful it is when we meet. When we embrace. When we hold the space for each other. 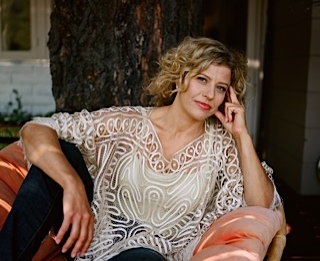 Our brokenness, our dreams, our yearning to connect. 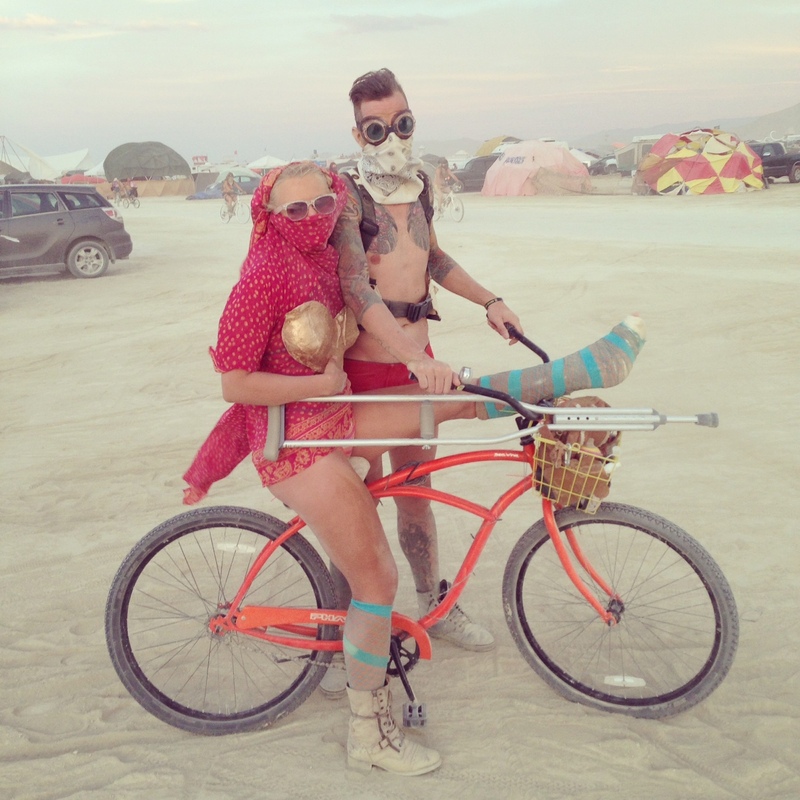 For a full week so packed with dust and magic it feels like a year, I went off the grid and entered the world of Burning Man. The pop-up temporary city of over 65,000 runs on a gift economy. I took photos to give to people. Mementos from the dust. It’s all about moments. Those times in our days, our lives, that burst into brightness. That stop time. That somehow make everything sharper, more vivid. At Writers On Fire, we call these Defining Moments. Sometimes, they are moments that define a life. Or a business journey. Sometimes they define a day. A photo can help jog a memory. Can give you outlines so you can sketch in the details. It is through shared moments, through stories, that we connect. That is all anyone wants. So many entrepreneurs are comfortable talking. Not writing. Why? Is that you? When you write, you commit your vision to the page, you give it bones. It takes stronger shape. It gains authority. It becomes memorable. Perhaps mythic. The more you learn to notice, to capture moments — and to commit them to both page and stage — the more authority you will gain. The more confidence you will exude. Critical things in the entrepreneur. Without them, you are dust. You disappear into the whiteout. So today, I invite you to take a photo with your cell phone of a moment that stands out in your day. It could be a commemoration of a meeting with a friend, or colleague, or lover. A gesture of thanks to someone who’s been of service. A tribute to an image that inspires — a perfect cappuccino, your child’s face, the way a peony sheds petals onto the ground. A slice of freeway that frames a palm tree just so. It could be whatever gives you pause. Whatever reminds you that you are here, that your Why is a living, breathing thing which roots you. What you notice will teach you about yourself. If we are leaders, then we must constantly seek self awareness. No longer is this type of deep engagement confined to the artists. Entrepreneurs must become creative entrepreneurs, or sink into obscurity. Your perception, your story, the moments that spark — this is marketing. This is meaning. This is what matters. To inspire you, check out my Facebook page or Instagram account for other pics I snapped at Burning Man with short captions. Enjoy! Please post your photos in the comments below or find us on Facebook at Writers On Fire to do so! Blood Moon Rising — Are You Suffering Personality Eclipse? Try the Confidence Cure!